I remember our first electric frying pan from the late 50s. It's legs were shorter than today's models so the heating element was closer to the countertop surface. And yet, with those shorter legs, I don't remember any particular build up of heat on the countertop. My kitchen has been gutted. The only thing left is the cabinet holding the sink. Here, I was trying out my new wiring with a new electric fry pan. (Why not use my new stove, instead? Well, my old receptacle was 3 pronged, so I bought a 3 pronged cord for the new stove. The receptacle died before I could use my new stove. City code requires new receptacles be 4 pronged and I've yet to get a 4 pronged cord). Anyway, I fried a pound of bacon in my new fry pan (not all at once). When I had finished, I lifted the pan and put it in the sink for washing. When I did, I noticed a lot of heat build up to the Formica countertop. I believe there was enough heat to cause the Formica to loosen and buckle. I know the Formica is very resistant to heat, but I'm not so sure about the adhesive used to glue it down. My new cabinets and countertops are on the way, so if there was heat damage to the old countertops, there's no problem. 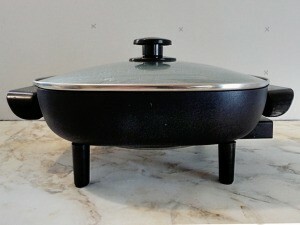 But you can be sure, when I use this fry pan on my new countertops, I will put a marble slab down to set the fry pan on. It's the little things that bug me the most. Why would a new fry pan with longer legs cause more heat buildup to the countertop than the older type with shorter legs? Go figure. Anyway, you might want to check to see just how much buildup of heat takes place under your fry pan. It might save you countertop replacement. I've also noticed the heat build up from the electric frying pan and from the George Foreman grill. When my stove isn't being used, I place the pan or grill on top. The crockpot sits there too when I'm making an all-day slow cook. It's safe. When I had the new countertop installed two years ago, I kept the cut-out piece from the sink and I use it for various things including counter protection and as a giant cutting board. Shelf moulding is available in various sizes and I found some to edge the cut-out so there aren't any rough edges. When it's not in use, it fits nicely between the stove and the cabinet beside it. I already have a slab of marble, so that settles that. I do appreciate you mentioning the cutout for the sink. I will be sure to ask my contractor to save it for me. We always put a marble slab under our heating elements, too. Can't trust anything. Well, can't trust me... I left a piece of plywood next to the oven on Thanksgiving. That was a scream. Literally.